These little stars will glow in the evening, adding romantic atmosphere and making your sleep sweeter. Adopts fine quality plastic and fluorescent paint as material. Eco-friendly and tasteless, non-toxic, anti-dust in material. 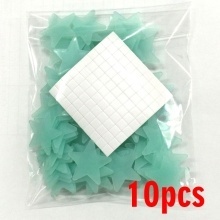 You can stick these star stickers on walls, ceilings, furniture, windows or mirrors as you like. You can place different kinds of shapes as you like, such as cats, bears or trees, etc. The stars will absorbing energy during the day and release light in the darkness. It can helps you to creating a relaxed atmosphere. Appropriate for decorating your room.